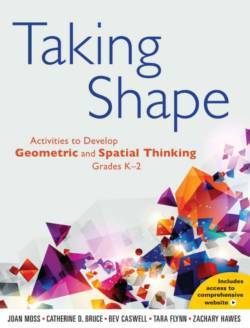 Excerpted from "Taking Shape: Activities to Develop Geometric and Spatial Thinking" by Joan Moss, Catherine D. Bruce, Bev Caswell, Tara Flynn, and Zachary Hawes. Published by Pearson Canada Inc., 2016, pp. 13–16. Reprinted with permission by Pearson Canada Inc.
Our journey began when we conducted an extensive literature review at the outset of the project (Bruce, Flynn, & Moss, 2012) and learned about the crucial importance of spatial reasoning. This theme was consistent across many research disciplines, including biology, cognitive sciences, psychology, developmental sciences, education, as well as educational neuroscience—an emerging transdisciplinary ﬁeld which sits at the intersection of these other disciplines and aims for a collaborative approach in which educational theory and practice are informed by new ﬁndings in the cognitive sciences, and vice versa (Fisher, 2009). We also learned—and have experienced in our careers as mathematics educators and researchers—that spatial reasoning is a curiously unacknowledged and neglected area of the curriculum. During our involvement with the M4YC project, we have become more and more convinced of reasons why we should pay attention to spatial reasoning in early years mathematics. Below we offer our Top Five reasons why, as educators, we should care about spatial thinking when we plan, observe, and assess mathematics in our classrooms. 1. Spatial reasoning and mathematical thinking are intimately linked. There are numerous research studies that demonstrate the relationship between spatial reasoning and what we typically think of as mathematical ability. For example, one research study found that the quality of block play at four years of age was a predictor of high school mathematics achievement (Wolfgang et al., 2001). Another study found a relationship between young children’s construction skills (such as playing with jigsaw puzzles and blocks) and strong number sense and success in solving mathematical word problems (Nath & Szücs, 2014). In fact, as Mix and Cheng (2012) report, “The relation between spatial ability and mathematics is so well established that it no longer makes sense to ask whether they are related” (p. 206). Researchers have underlined that the link between spatial reasoning and math is so strong that it is “almost as if they are one and the same thing” (Dehaene, 1997, p. 125). Reﬂecting on the strength of this relationship, others have noted that “spatial instruction will have a two-for-one effect” that yields beneﬁts in mathematics as well as the spatial domain (Verdine, Golinkoff, Hirsh-Pasek, & Newcombe, 2013, p. 13). Of course, the practices of mathematicians also beneﬁt from spatial reasoning; many mathematicians stress that their work relies strongly on visual and spatial representations and forms of understanding (Whiteley, Sinclair, & Davis, 2015). We can see how the various strands of mathematics are inherently spatial. Think about what happens when we compare the area of two polygons, such as a rhombus and a rectangle. To be successful, we can draw on spatial strategies such as composition and decomposition of 2D shapes, mental rotation, and visualization. In fact, research shows that spatial reasoning is linked to performance within many strands of mathematics including: basic magnitude and counting skills (Thompson, Nuerk, Moeller, & Cohen Kadosh, 2013), mental arithmetic (Kyttälä & Lehto, 2008), word problems (Hegarty & Kozhevnikov, 1999), algebra (Tolar, Lederberg, & Fletcher, 2009), calculus (Sorby, Casey, Veurink, & Dulaney, 2013), and advanced mathematics (Wei, Yuan, Chen, & Zhou, 2012). In one of the ﬁrst studies of its kind to show speciﬁc links between spatial and mathematical skills, Cheng and Mix (2013) assessed children in both spatial and math skills. Children were randomly assigned to one of two groups: one group engaged in spatial training involving mental rotations, and the other group spent the equivalent amount of time working on crossword puzzles. Both groups of children completed pre- and post-tests involving a range of math and spatial skills. Children in the spatial training group outperformed those in the crossword puzzle group, demonstrating signiﬁcant improvements in their calculation skills. In another study, Verdine, Irwin, Golinkoff, and Hirsh-Pasek (2014) found that a child’s spatial skill at age three was a reliable predictor of the child’s grasp of number concepts such as more, less, equal, and second, as well as overall number knowledge skills. Taken together, research suggests that spatial instruction offers a potentially powerful means of supporting children’s mathematical thinking and learning. 2. Spatial reasoning can be improved. Education matters! Spatial reasoning is malleable; that is, it can be improved. Spatial reasoning is not a biologically determined cognitive trait as was once thought to be the case. A recent meta-analysis of 217 studies, representing more than two decades of research on spatial training, found that a variety of activities improve spatial reasoning across all age groups (Uttal et al., 2013). Not only did the authors ﬁnd that spatial training led to improvements on spatial tasks closely related to the training task, but improvements were also seen on other types of tasks that were not part of the training. More research is needed to discover how and why this is the case. 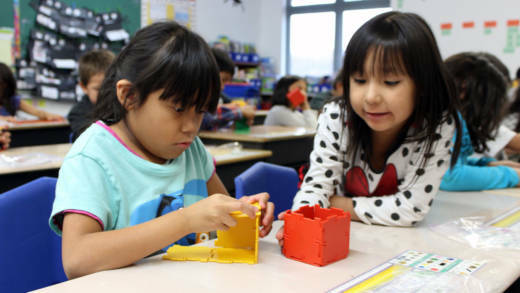 In the meantime, the ﬁnding that spatial ability can be improved at any age has massive implications for educators, particularly given that spatial reasoning is proving to be an important domain with strong connections to mathematical achievement. 3. Spatial thinking is an important predictor of achievement in STEM careers. Research shows that spatial thinking is an important predictor of achievement in the STEM disciplines—science, technology, engineering, and mathematics (Wai, Lubinski, & Benbow, 2009). Sometimes these are called “STEAM” to reﬂect the inclusion of the arts. In addition, recent research indicates that early attention to developing children’s spatial thinking increases achievement in math and science and can promote skill and interest in future careers in STEM disciplines (Newcombe, 2010). Currently, many countries are concerned by the low numbers of post-secondary students, particularly female students, entering these disciplines. For example, a 2013 report found that fewer than 50 percent of Canadian secondary school students were graduating with senior-level STEM credits, while 70 percent of the highest-paying jobs require expertise in these disciplines (Let’s Talk Science [with Amgen Canada Inc.], 2013). Geometry spans mathematics and science and plays a central role in disciplines such as surveying, astronomy, chemistry and physics, biology, geography and geology, art and architecture (Wai, Lubinski, & Benbow, 2009). 4. Spatial reasoning is currently an underserved area of mathematics instruction. The National Council of Teachers of Mathematics recommends that at least 50 percent of mathematics instruction focus on spatial reasoning (National Council of Teachers of Mathematics [NCTM], 2006, 2010). Despite calls to bring geometry and spatial thinking to the forefront of early math curricula, local and international studies reveal that geometry and spatial sense receive the least amount of attention in early years math (Bruce, Flynn, & Moss, 2012; Sarama & Clements, 2009a), making it an underserved area of mathematics instruction. Spatial thinking is important in many areas of mathematics and beyond; most subjects in school—art, geography, science, language, and physical education to name a few—rely on at least some aspects of spatial thinking. Yet spatial reasoning itself is rarely, if ever, paid explicit attention. The National Research Council (2006) has highlighted this as a “major blind spot” in education and calls on educators and researchers to pay attention to spatial reasoning. Otherwise, the Council warns, spatial reasoning “will remain locked in a curious educational twilight zone: extensively relied on across the K–12 curriculum but not explicitly and systematically instructed in any part of the curriculum” (p. 7). Geometry and spatial reasoning in the early years typically focus on having children label and sort shapes (Clements, 2004), yet cognitive science and educational research, including the M4YC research, shows us that young children are capable of—and interested in—more dynamic and complex spatial thinking. 5. Spatial reasoning provides multiple entry points and equitable access to mathematics. Many educators in our research classrooms have found that a focus on spatial reasoning provides multiple entry points for children to explore mathematics in an accessible and inclusive way. In fact, many educators have reported to us that, through using the activities that now appear in this book, they have been able to see their students in a new light. This, in turn, gives children the opportunity to participate in the mathematics and to contribute to mathematical discussions in the classroom, building their identities as mathematicians. For example, educators have found that some children who may be struggling in the area of number sense may excel in the area of spatial reasoning. For most children, a spatial approach enhances their developing sense of number. According to Baroody, Lai, and Mix (2006), “Most individual differences [in math ability] are probably due to the lack of opportunity” (p. 200). When we focus on spatial reasoning, we highlight and invite the diverse strengths that children bring to school (Flynn and Hawes, 2014). Joan Moss is an Associate Professor in the Department of Applied Psychology and Human Development at the Dr. Eric Jackman Institute of Child Study at the Ontario Institute for Studies in Education of the University of Toronto. Catherine D. Bruce is a Professor and Dean of the School of Education and Professional Learning and Director of the Centre for Teaching and Learning at Trent University. Bev Caswell is the Director of the Robertson Program for Inquiry-Based Teaching in Mathematics and Science at the Dr. Eric Jackman Institute of Child Study and Assistant Professor, Teaching Stream at the Ontario Institute for Studies in Education of the University of Toronto. Tara Flynn is an educator, author, and editor, and Project Manager and Research Officer for Dr. Cathy Bruce at the Trent University School of Education and Professional Learning. Zachary Hawes is a Ph.D. candidate in the Numerical Cognition Laboratory at the University of Western Ontario. Prior to this, he completed his M.A. and teacher training at the University of Toronto’s Dr. Eric Jackman Institute of Child Study.